If you enjoy old B movies such as Hot Rod Girl (1956) with its stock footage of early drag racing and Chuck Conners playing the friendly, help-the-kids cop, and Ghost of Dragstrip Hollow (aka Haunted Hot Rod 1959) featuring cameos of both Tommy Ivo’s Buick rail job and George Barris’ Ala Kart, Henry Gregor Felsen’s (1916–1995) beloved Hot Rod is for you. Beloved? 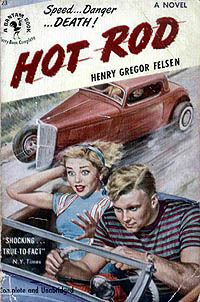 Considering that this 1950 book was reprinted yet again in 2011, that various websites devoted to Felsen have mushroomed, and that early editions are selling on Amazon for hundreds of dollars, “beloved” seems just the word to describe Hot Rod. There has not yet been a film version of this book, and this is surprising in that the plot would be readily adaptable to the screen. Bud Crayne wears jeans, boots with chains, a hip fedora, and a motorcycle jacket. Orphaned, he has practically raised himself; at seventeen, we find him working at the local garage, a loner, and the best hop-up builder and driver in his rural town of Avondale. We have La Verne, his pretty girlfriend who dreams of movie stardom; Wally, the town bully whose car is all flash—“a lot of noise and not much performance;” Marge the wallflower; and the amiable, good-hearted Chuck, who, if not for Bud’s driving expertise getting him to the hospital on time, would surely not have survived the accident—the accident that killed off half of Avondale’s teenagers. And this is not to mention the previous wreck that killed little Jimmy and little Kenny who stole a car and who had dreamed of driving just like Bud. And although it would be easy to designate these characters as “stock,” Felsen goes beyond stock to flesh them out some, make us care some. There’s Ted O’Day, the friendly cop, and Mr. Cole, the caring and devoted shop teacher; they make it their mission to save the troubled young Bud. Bud is conscience stricken—wasn’t he the one who had preached to the accident victims that the use of power and speed was the only way to drive? In the aftermath of the carnage, O’Day and Cole initiate the town’s first Roadeo, a test of skill, automotive knowledge, and safety. 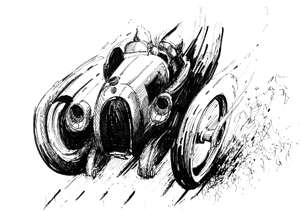 Bud only comes in second, both killing his chance for an engineering scholarship and ruining his reputation as the speed king of Avondale. But he finally accepts Cole’s help and instruction, gets a second chance—and we can surely guess the ending. 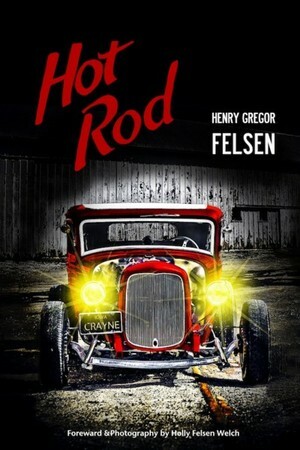 I have yet to mention that Hot Rod is ostensibly a Young Adult novel, but don’t let this put you off. 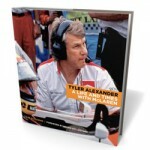 This book is for young adults of any age, a book for gearheads of all ages. 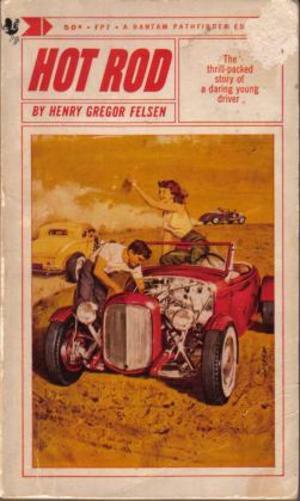 It is written by a muscular storyteller who is not condescending to his young readers and who is capable of lyrical prose: “Along the freshening face of the Earth the gentle wind drove little herds of spring scents.” The various website fan reviews inevitably begin with something like: “I was twelve when I first read Hot Rod, and I remember Bud’s race to Trenton as if it were yesterday.” And with good reason: scenes such as the Trenton run tremble with unbridled speed, police pursuit, gunfire, recklessness, courage, adventure. The new edition has a charming introduction by Felsen’s daughter, Holly Felsen Welch, which gives insight into the genesis of the novel, kind filial reminiscence, and fan appreciation. 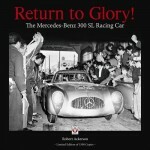 The seven pages of vintage family photographs and early cover illustrations add to our enjoyment, and the Welch’s car photos gracing each chapter are striking. 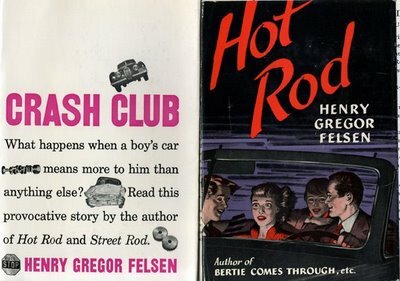 And, I suppose, it is a wonder that this review did not start off with “I first read Hot Rod when I was thirteen….” A wonder because it would be truthful: I liked it then, and, upon rereading it as an adult, I like it still.